In my past articles for Liftopia, I’ve made reference to being fairly new to the sport of snowboarding. As such, I’ve been so engulfed in bettering myself and riding as many days as possible, that I have not stopped to take the time, appreciate, and thank the pioneers of this sport. Believe it or not, this story begins in Muskegon, Michigan. It’s not exactly the place you’d think of when imagining the birthplace of modern day snowboarding. Most likely, you’d think of Colorado, Utah, or Alaska. But there in that place of rolling hills, lived a man by the name of Sherman Poppen. One holiday season in 1965, Sherman Poppen got an idea for a present for his daughter. He had a steep hill behind his house in Muskegon, MI and wanted to give his daughter another entertaining way to get down the hill. So, he created the Snurfer. He attached two skis side-by-side, tied a rope to the nose(s) for the snow-surfer to hold onto, and forever changed the snowsport industry. In 1966, he finally patented his idea. Instead of two skis, he used one solid piece of wood in the shape of a very wide ski. However, his Snurfer was shorter than a regular pair of skis and wider than two of them put together. He also added anti-slip surfaces for your feet since there were no bindings (we’d call them stomp pads now), and the rope connected to the nose for added stability remained. It’s supposed that in the next 10 years, over 1,000,000 snurfboards were sold. It’s clear that many people were experimenting with different ways to attach their feet to the board so pinpointing an exact person to give credit is hard to track down. 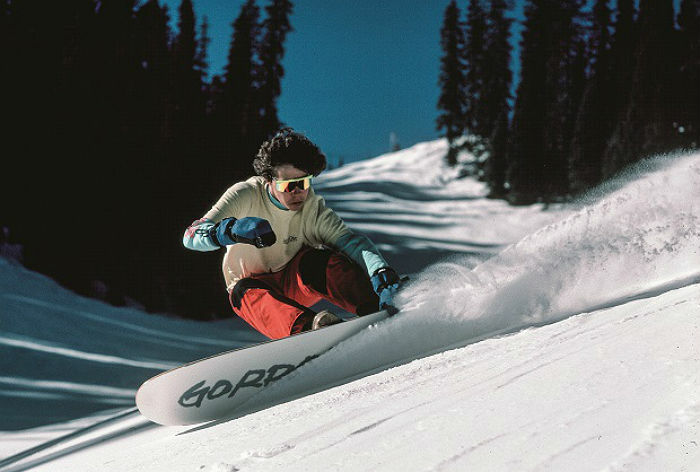 However, there is one person that is largely accepted as the father of bindings and the modern snowboard. With the huge success of the snurfer, or snurfboard, they began holding annual World Snurfing Championships. Of course, “World” was relative because the furthest anyone came from was Vermont. And believe it or not, these were still held in Michigan. In 1979, Jake Burton Carpenter (that middle name sound familiar to you???) entered the Snurfing Championship, but rather than using the traditional snurfboard, he removed the rope and used his own set of homemade bindings. While it was still just one “board” under his feet, the judges determined that it was too different from the intended design. They created an “open” division for this type of design, and Jake Burton, as the sole competitor in that division, won the first ever snowboarding world championship. By now, snowboarding definitely became a thing, and it wasn’t going anywhere. National racing events were being held around the country in places like Leadville, CO; Woodstock, VT; and Mt. Baker in WA. As the decade went on, all the major ski areas were hosting competitions as well. Until 1983, bindings were simply across the toes and ankles. Then Jeff Grell stepped in and made the highback bindings that we know today. This was the first time snowboards were able to ride on hardpack. In 1985, metal edges were added to the boards and the traditional surf fins all but disappeared. Boards were now marketed as carving boards. The Europeans caught on to this new fangled craze and started hosting their own competitions in 1986. Throughout this decade, the sport kept growing and growing and growing. Snowboarding was once banned from resorts, but these were gradually being lifted due to the popularity and income generation. (Though, popular resorts such as Alta and Deer Valley in UT still ban snowboarding.) More and more competitions were popping up all over the U.S., Canada, and Europe. By the end of the 80’s, it had gotten so popular that colleges were offering snowboarding as a club sport. As I just mentioned, snowboarding had become so popular that professional surfers and skateboarders had started entering the snowsport realm. Competitions were starting to add obstacles to the course. As more and more gifted athletes started riding, the boundaries and limits of what could be done on a snowboard kept being pushed and pushed. By 1993, there were over 50 different brands producing and selling snowboards to the general public, and the first company to go public was Ride in 1994. Material and build technology evolved as well as shapes, edges, and camber. There was now a board to fit any kind of riding style and terrain. Snowboarding was officially made an Olympic sport in 1998 at the Nagano Olympics in Japan. My personal story is that I was in Junior High and High School in the 90’s. Everyone I knew was learning how to snowboard. Even friends that were winning regional ski races in elementary school were trading in their two sticks for one. And this was a small town in WI. As I look back now, I can only imagine what the scene may have looked like in big resort towns and nearby cities such as Tahoe, Salt Lake City, and Denver. In the early 2000’s, all the momentum that was built behind snowboarding in the 80’s and 90’s was still being carried into the new millennium. It was now a regular sport at the Olympics and we saw people like Shaun White dominate the X-Games. But then things started to change around the mid-2000’s. Resorts weren’t seeing as many snowboarders anymore. So what happened? In this great story by Outside Online, they do a wonderful job explaining in detail the downturn of snowboarding. The gist of it, however, is that all the teenagers and 20-year-olds of the 80’s and 90’s were now starting to grow up. They got real jobs and houses and kids and responsibilities. But that never stopped skiers; what’s the deal with snowboarders? The theory is that snowboarding comes with a defined image. It’s the image that those early pioneers made as 20 year olds, and it never changed. The baggy pants, straight-brimmed hats, and cocky attitude was the mold you “had” to fit in order to ride. As people grew out of that mold, they no longer rode but the image remained the same. It’s as if the image defines the rider instead of the riders defining the image. So now we have an image that largely only appeals to the same late-teens to 20-year-old crowds. But those same kids are now picking skiing over snowboarding instead for whatever reason. The older riders are moving on and the new generation isn’t finding it appealing. My personal opinion is that snowboarding is here to stay. Everything in the world is cyclical, and snowboarding is still a young sport in the grand scheme of things. In the 70’s I’m sure it was viewed as a fad. Then it took hold in the 80’s. By the 90’s, it had made its first peak and declared that it is here to stay. But nothing can keep going up and up forever. There will always be a downturn at some point, and we are just now seeing the first one. Just as snowboarding was peaking and growing wild with popularity, I’m sure skiers saw their numbers fall and wondered why as well. So will snowboarding take a hit for the coming decade(s)? Yes, probably. But it will weather the storm. There will always be a community of riders no matter how small it gets. And then one day, BOOM! Some new innovation or technology will emerge and it will come back on the upswing. I mean… People are STILL buying Snurfboards. My theory on the downward trend of snowboarding is that ski technology cought up with snowboards. A couple of examples of this are the switch ski design, the different bends(rockier-camberred ect..) and the width of the skis. Plus the style and attitude of skiers changed, short explanation, it became cooler in the public eye. This all led to a shift back by the next generation, away from what there parents did. Great artical I’ve been riding for a while and found everything insightful. Great work with some of the History – let me suggest you also follow up with Tom Sims his first board trip was on a snowy sidewalk in NJ 1963 – he brought his original ” Board ” to all Sims Directors Meetings – it was a skate board with the trucks removed and aluminum foil on bottom to make it snow worthy – Hope Sims Family still has it – carpet stapled on top allowed goulashes to stick. Tom was the California side and Jake the Vt – Jake really nailed the business model and has done great service to the lifestyle and industry . Tom was very passionate and pure to the sport – but not quite the business man his Company needed – a wonderful guy always. Get the old timers talking – I’m 65 ( been skiing since 1953 in NH Cannon Mt- snow boarding less and skiing more now) Jake is getting on and Tom died of a heart attack a few summers back. Snowboarding is here to stay thanks to these pioneers.